Protein-losing enteropathy is a feared late complication of all forms of the Fontan operation. The etiology of this disease is unclear, but it may be associated with increased systemic venous pressure, systemic ventricular dysfunction or AV valve regurgitation, or mechanical obstructions affecting the Fontan circuit. We report a new putative cause of PLE in a young patient. 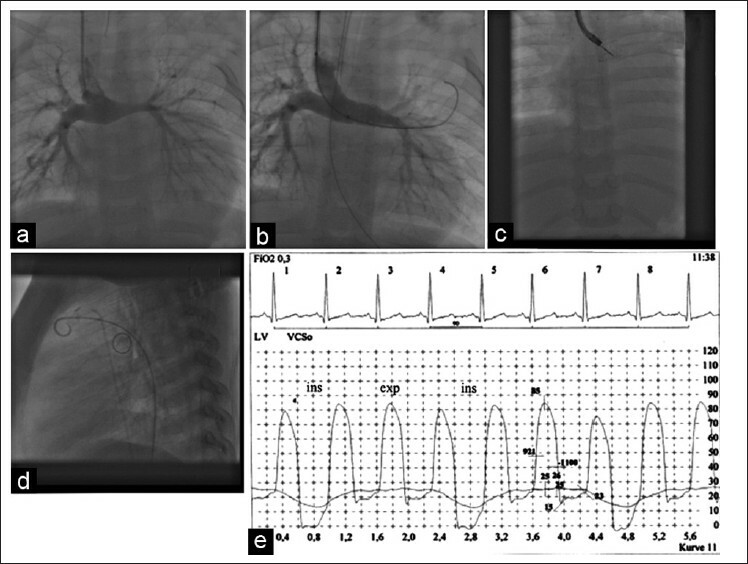 A term neonate with hypoplastic left heart syndrome underwent a Norwood type of palliation in the neonatal period, followed by a bidirectional superior cavopulmonary shunt at 4 months of age. The postoperative course was complicated by recurrent pleural effusions. 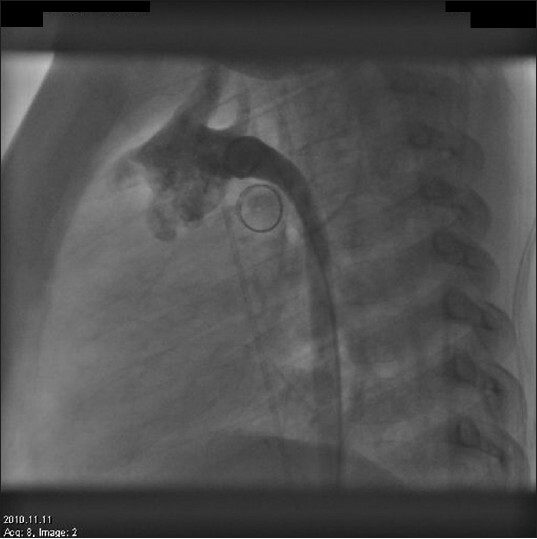 Cardiac catheterization demonstrated a small left pulmonary artery which was treated by stent implantation [Figure 1]a. At 2 years of age, the stent was redilated to 10mm diameter, to match the diameter of the right pulmonary artery [Figure 1]b, followed by Fontan completion using an extracardiac conduit. In the postoperative period, the patient was diagnosed to have a stenosis of the left bronchus, but could be weaned successfully from the ventilator. Six months later, he presented with protein losing enteropathy (PLE). A combined cardiac catheterization and bronchoscopic study were performed, with the patient breathing spontaneously. There were no stenoses in the Fontan pathways. The left bronchus was severely obstructed (>70%), directly behind the stent in the left pulmonary artery [Figure 1]c and d. Simultaneous systemic ventricular and pulmonary arterial pressure traces demonstrated a rise in the ventricular diastolic pressure during expiration to 25mm Hg. During inspiration, the end diastolic pressure normalised, with a reduction in the mean pulmonary artery pressure to normal values for the Fontan physiology [Figure 1]e. Bronchial compression by aorta was also ruled out [Figure 2]. We postulate that the stent acts as a valve, with the child generating high intrathoracic expiratory pressure against the stent, which in turn is reflected in the behaviour of the ventricular diastolic pressure. The intermittent elevation in systemic venous pressure is probably causative for PLE. The patient is currently under a trial of conservative management (oral corticosteroid therapy and albumin replacement therapy), and is at home. Reoperation (removal of the stent) and patch-plasty of the LPA is under consideration. In current cohorts, the Fontan operation is associated with improved outcomes and increasing short and long-term survival. , It may be expected that a significant proportion of patients will reach their teens and young adult life. Factors accounting for late attrition include systemic ventricular dysfunction, AV valve regurgitation, changes in the pulmonary vascular bed, late arrhythmias and PLE. Previous studies have demonstrated that PLE is associated with a significantly worse outcome, , and every effort should be made to manage these patients aggressively, using a combination of optimal pharmacological therapy and surgical or catheter based interventions to relieve mechanical problems affecting the Fontan circuit. ,,, In the patient presented here, we postulate a new mechanical problem as being causative for PLE, with intermittent sharp increases in intrathoracic pressure accounting for elevation of the systemic venous pressure, and concomitant intestinal protein loss. 1. Hirsch JC, Goldberg C, Bove EL, Salehian S, Lee T, Ohye RG, Devaney EJ. Fontan operation in the current era: a 15-year single institution experience. Ann Surg 2008;248:402-10. 2. Huddleston CB. The failing Fontan: options for surgical therapy. Pediatr Cardiol 2007;28:472-6. 3. Mertens L, Hagler DJ, Sauer U, Somerville J, Gewillig M. Protein-losing enteropathy after the Fontan operation: An international multicenter study. PLE study group. J Thorac Cardiovasc Surg 1998;115:1063-73. 4. Meadows J, Jenkins K. Protein-losing enteropathy: Integrating a new disease paradigm into recommendations for prevention and treatment. Cardiol Young 2011;21:363-77. 5. Ghanayem NS, Berger S, Tweddell JS. Medical management of the failing Fontan. Pediatr Cardiol 2007;28:465-71. 6. Menon SC, Dearani JA, Cetta F. Long-term outcome after atrioventricular valve surgery following modified Fontan operation. Cardiol Young 2011;21:83-8. 7. Menon S, Hagler D, Cetta F, Gloviczki P, Driscoll D. Role of caval venous manipulation in treatment of protein-losing enteropathy. Cardiol Young 2008;18:275-81.